It’s what you can’t see that matters most. 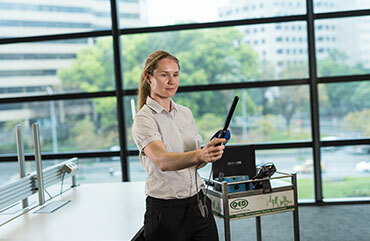 QED Environmental Services is one of Australia’s leading Indoor Air Quality consultancies, auditing millions of square metres of space nationally across office, retail, education and healthcare. Uniquely, we integrate HVAC hygiene and indoor air quality monitoring, ensuring compliance with Australian Standards and infection control guidelines (for healthcare facilities). As the only NATA accredited indoor air quality inspectors, and with 25 years’ experience, we work with our clients to create performance / risk programmes tailored to their maintenance priorities. Workplace safety regulations impose a duty of care on property owners and managers to maintain safe spaces as far as practicable - which means taking reasonable measures to understand the likelihood, severity and means of control for hazards. Australian Standards must be met or exceeded: AS1668.2 mechanical ventilation, AS3666.3 cooling water systems and SAA HB32 control of microbial growth. Polluted indoor air is a hazard to the occupants of a building, research shows that some people have heightened sensitivity to the impact of certain pollutants. Regular IAQ auditing gives you peace of mind, ensuring ongoing compliance of your building and offering solutions to suit your capital and maintenance budgets. Tenant organisations favour properties with an all-encompassing sustainability agenda of design, rating and performance. These three factors are all relevant to energy, waste, water, and of course indoor environment comprising air quality, acoustic and thermal comfort. Considering performance for indoor air, research studies prove that occupants are more productive for cognitive tasks in workspaces with favourable air quality, and the economics for tenants is compelling. For example a US study estimated that increasing ventilation at a cost of $14-40 per occupant per year has an 8% productivity improvement for a value of $6,500 per occupant per year. Demonstrating your commitment to sustainability and IAQ performance is imperative in today’s market. For more information, or to book your IAQ consultation contact us today.